Oxygen concentrators have become enormously popular in the past few years as fast-moving technologies have made these units more affordable, more reliable, quieter and more durable. Just the simple relief from having to schedule, wait for and receive O2 tank deliveries is incredibly liberating for those tethered to an oxygen supply as a normal part of their everyday lives. 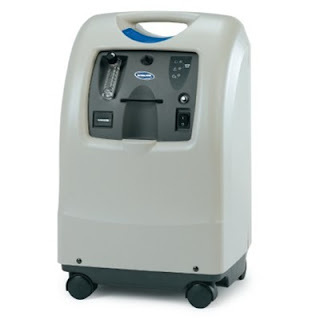 The only weekly maintenance required for your stationary oxygen concentrator is the cleaning or replacement of the oxygen concentrator’s cabinet filter. However, there are some oxygen concentrator safety measures to be aware of. Care should be taken not to operate one in the presence of wood smoke, tobacco smoke or airborne chemicals. Because these units are sucking in ambient air to produce concentrated oxygen for the patient's breathing needs, anything in that air can potentially make its way into the system. Once fouled, the contaminants are nearly impossible to get rid of without a total machine tear-down. For those who are able to get out and about a bit, but still need a steady supply of supplemental oxygen to deal with their breathing challenges, the relatively new portable oxygen concentrators, or POCs, have become a godsend. Even those who had previously been using portable oxygen tank setups were often reluctant to take them any distance from home. They feared running out of O2 and were sometimes self-conscious about the image portrayed by these cumbersome systems. The new portable concentrators cost a little more than the stationary home models, but they can actually replace the need for a home system altogether, if desired. These units work on battery power, conventional electrical plug-in power or even D/C on some models, so they'll plug right into an automobile's cigarette lighter receptacle. The batteries on these POCs are important accessories, and many come with an additional battery so the user will have one in reserve. Depending on the particular model, a single battery charge will last anywhere between 3-8 hours. When a unit is plugged in and operating on A/C power, the batteries will normally recharge simultaneously. For long battery life, it's important to recharge the batteries as soon as possible after use. Letting them sit uncharged for any length of time is not a good idea. Maintaining a POC is a snap. Clean it with a damp cloth and don't use any strong chemicals. Find out where the filter(s) are located and determine if they can be cleaned or if they must be replaced. Take special care when making any connections as these parts may break if handled roughly. The same goes for the entire unit, which is a fairly fragile piece of equipment. Oxygen concentrators will save you time and money and free up your life in many ways. For more information, give us a call. Let us help fulfill your supplemental O2 needs.